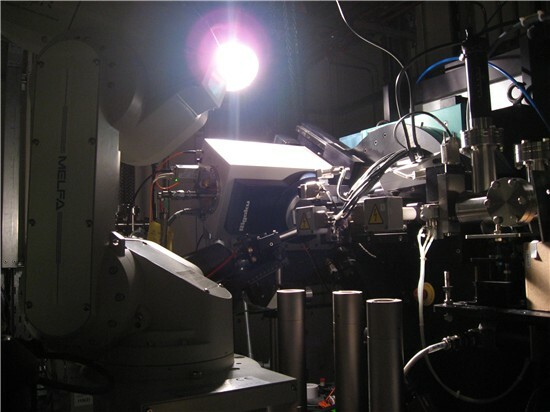 The time allocated at Diamond (I19) to the Chemical Crystallography Service has really brought the power of synchrotron radiation to our attention. We are actively engaged in a number of collaborative research projects with scientists at Diamond Light Source. These include exploiting the tunability of synchrotron radiation and Karim Sutton is a joint student with his research focussed on harnessing variable wavelengths. Other areas of interest are the effects of radiation on small molecule crystals and the study of complex diffraction phenomena. Dr. Kirsten Christensen and Dr. Amber Thompson are also visiting scientists at Diamond and generally spend one afternoon a week there.